Each Aji’s product is hand-made by the elderly community in Nepal. The items are more than just a product. They have the touch of love and carry unique stories of life and inspiration. For shipments to US, please visit our Etsy store. For shipments in Kathmandu, please fill out our order form. Our products are also available at Timro Concept Store in Kathmandu. Dhaka Baby Bhoto Set comes with bhoto (a traditional Nepali full sleeve coat), trouser, cap and inner vest by 71 year old Pragya Shakya. Each item is made of two layers of pure cotton fabric and traditional Nepali Dhaka fabric stitched in between. The fabric is very soft, breathable and sweat absorbable. It can be used in all seasons and is a good fit for newborns and babies up to one year old. Muda Stool is handmade by 66 year old Ram Maya Maharjan of Siddhipur, a farming village in outskirts of Kathmandu famous for its sukul (traditional Nepalese straw mats). The straw used to make sukul and this stool is a by-product of the rice crop from Maharjan family farm. The Muda Stool weighs approximately 2.86 kgs and is 14 inches tall and 13 inches wide. The Darling Dress is a beautiful hand-knitted woolen dress made by 58 years old Aji's Maker Anju Pant of Thaiba. It is perfect for your little ones aged 1 to 3 during spring or paired with stockings and sweater during winter. It comes in beautiful cherry red with more colors to follow. Dori (डोरी) means rope is Nepali language. Dori plant hangers are macrame products made of cotton ropes that add a bohemian touch to your space. “All that is needed is some rope, your hands and your imagination,” says Shiro Moktan, the maker of Dori. Suku (सुकु) is traditional Newari straw mat made by 66 year old Ram Maya Maharjan. It is hand-woven by binding straw ropes together. Ram Maya’s family has been making straw mats for generations. They hail from Siddhipur in the outskirts of Kathmandu where hay mats have been woven for centuries. Handmade by Late Gyani Laxmi Manandhar (1927- 2019). Mheecha (म्हीचा) is traditional Newari pouch made of locally made cloth and a unique combination of threads to open and close the pouch, similar to lasso style. Poh (पु) are handcrafted bracelets made of colorful glass beads by Menuka Shrestha. Each bracelet is made of hundreds of tiny glass beads stringed together to form a loop. The glass beads were traditionally worn by Nepalese women as a symbol of marriage. These make for great fashion accessories regardless of your marital status and gender. Hand-sculpted Dharma Chakra fridge magnets by 70 year old Juju Ratna Tamrakar. Dharma Chakra (धर्म चक्र) means ‘Wheel of Law’ and represents the Buddhist eightfold path. Each piece is made with paper and clay and is approximately 6 cm in diameter. Pata Straw Coaster is a handmade kitchen coaster made by 66 year old Ram Maya Maharjan who lives in the Siddhipur, a farming village in outskirts of Kathmandu. The Pata coasters are made of straw which is a by-product of the rice crop from Maharjan family farm. The coasters is 19.8 cm in diameter and 1 cm thick. Hand-sculpted Swayambhu Stupa (स्वयम्भु ) by 70 year old Juju Ratna Tamrakar. The stupa is made of clay and lokta paper (handmade paper indigenous to Nepal). Hand-knitted woolen headbands by 73 year old Sushila Sthapit. Tapu (तपु) is designed to cover the head and ears to keep them warm. Dhaka Baby Blanket is handmade by 83 year old Dil Hera Tuladhar. it is made of two layers of pure cotton fabric and traditional Nepali Dhaka fabric stitched in between. It can be also be used as a swaddle for babies and is reversible. The blanket is approximately 89 cm wide and 102 cm long. Button Cowl is hand-knitted cowl by 58 years old Rita Moktan from Dhumbarahi neighbourhood of Kathmandu. 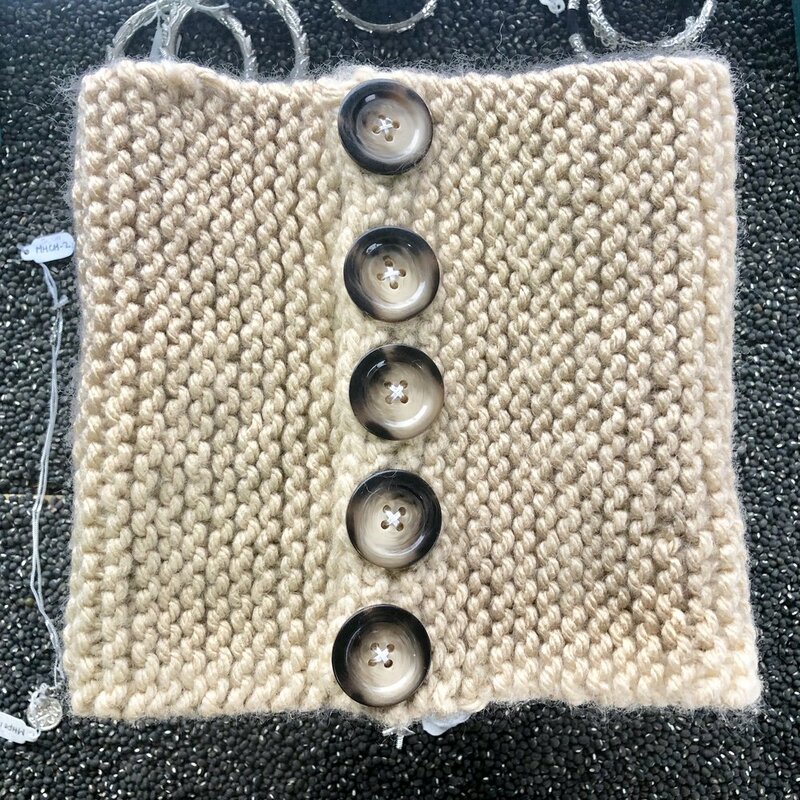 The cowl is made of soft wool with a unique pattern and five buttons. The buttons can be in the centre or either side of the neck, giving a stylish touch. It can be worn with your sweater or coat to keep the neck area warm. Tara Puja Set made by 70 year old Necklace Sthapit. The set includes Pancha pata (पंच पता), Karan paka (करन पका), Pasuka (पसुका), Doncha (दोंचा), and Eta (इता) required for Tara puja ritual.